Employers have three different programs available to offer employees pretax savings to pay for unreimbursed health care: health care flexible spending accounts (HCFSAs), health reimbursement arrangements (HRAs) and health savings accounts (HSAs). Each program has pros and cons, along with different requirements. The requirements under HRA and HSA programs can differ greatly from an HCFSA program and from each other. This course will provide an in-depth look at HSA and HRA programs as well as how these programs interact with an HCFSA. Comparison of HSAs, HRAs and HCFSAs—including a printable chart. The skin chart analyzes twenty different plan features. Bonus material explains how each feature is applied to each of the three programs. 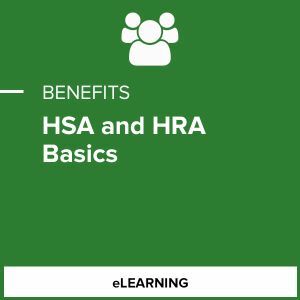 This course is geared for professionals who institute and/or administer HSAs and HRAs and include professionals new to the field of employee benefit plans, insurance producers, new multiemployer and public sector trustees, newly hired administrative support staff, call center employees, or those needing a topical refresher. The average time to complete this course is 3 hours. You will have 180 days from the date of registration to complete the course.